Resume A/B Testing involves sending out a fake version of your resume to get answers to your most critical questions like, 'Should I go back to school in order to switch career paths?' or 'If I take this job will it pigeonhole me down the line?'. Home > Popular > A/B Testing. Fake Resume, Real Results. Step 1. Define your A/B test. Step 2. Rewrite your resume. Step 3. Create resume variations. Step 4. Interview & mine HR for info. Step 5. Analyze your results. Step 6. Make a move. Resume A/B Testing involves sending out a fake version of your resume to get answers to your most critical questions like, ‘Should I go back to school in order to switch career paths?’ or ‘If I take this job will it pigeonhole me down the line?’ or ‘If I accept the promotion to product manager will that help me transition to management consulting in a few years?’. Let’s look at the third question: ‘If I accept the promotion to product manager will that help me transition to management consulting in a few years?’ You can A/B test for this by backdating your resume by 2-3 years, adding the product manager role and then applying to management consulting jobs. In this fake version of your resume it looks like you’ve already been working as a product manager for two years. Are consulting firms emailing you to set up interviews? or not? Whatever the case, you now have an empirically validated answer to your original question. When you have eliminated all that is impossible, whatever remains must be the truth, no matter how improbable. 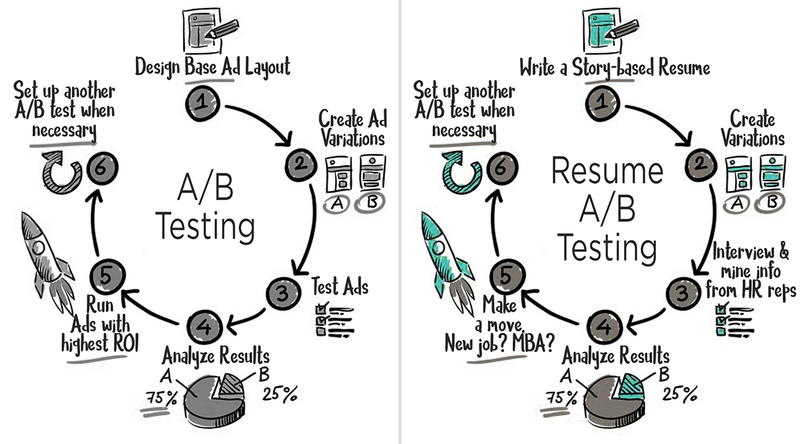 The idea for resume A/B testing was inspired by the development process that app designers and online marketers use. Before launching a new app or investing in a full-scale ad campaign, several ideas are A/B tested to ensure that time and money is invested in the most successful iteration. If marketers use A/B testing to decide on, say, a campaign slogan, why not use the same technique to substantiate your own career decisions. Meet Tom. Tom is tired of working in project management at Merck, a big pharmaceutical company. He wants to work at a tech company like Amazon. Tom sent his current resume to Amazon two months ago and never heard back. Now he’s not sure if a) his resume is the problem or if b) he needs an MBA to make the transition to tech. Look for a new job now. Tom wonders how marketable he is right now. What sorts of jobs can he get with his current story and resume vs. what jobs could he get if he put his best foot forward by rewriting his resume and polishing up his interviewing skills? Look for a new job now or put work on hold for two years while pursuing a full-time MBA. Get a job at Amazon post-MBA. Land a Senior Project Manager role at his current company (Merck). Tom has a strong network within the company and is pretty sure he’ll get the job if he applies. Tom wonders if getting that job at Merck now wouldn’t open up just as many career opportunities for him in three years time as an MBA would. At this juncture, 99% of people would try to answer Tom’s questions by reaching out to their coworkers, network and friends to ask them what they thought. People’s thoughts are nice, but Tom wants hard evidence to support his decision. Ideally Tom should perform a quality control test on his resume by A/B testing his current resume against a rewritten, story-based version. In my experience, more than 90% of the time when people aren’t getting the momentum they want from the job market, it’s because their professional story is a mess (and so is their resume). Before Tom starts A/B testing questions like ‘Should I get an MBA’ or ‘Should I take the Senior Project Manager role?’ Tom gets a story-based resume written. But some of you will be able to do a decent job rewriting your resume on your own. The first thing you’ll have to do is make some mental shifts. You need to rethink the goals of a resume, and rethink the rules of a resume in order to approach the project like professional resume writer would. We’re going to run A/B Test #2 – Look for a new job now or put work on hold for two years while pursuing a full-time MBA. Get a job at Amazon post-MBA. Tom decided to get his resume rewritten so resume R1 is a new and improved version of his original resume. Resume Variation R1: Look for a new job now. Resume 1 is Tom’s rewritten resume. In this scenario Tom looks for another project management job now – both in pharma and in tech. We’re trying to get an idea of where Tom stands in the job market at present. We’re particularly interested in how much response Tom get’s from tech companies because initially he felt he needed an MBA to get traction with them. Resume Variation R2: Complete a full-time, 2-year MBA program at Chicago Booth. In this scenario we modify Resume 1 so that it looks like Tom began his MBA program at Booth two years ago and is now back in the job market. Tom uses his R2 resume to apply for project management jobs in pharma and in tech. We’re particularly interested in the impact a 2-year MBA will have on Tom’s ability to land a job in tech. 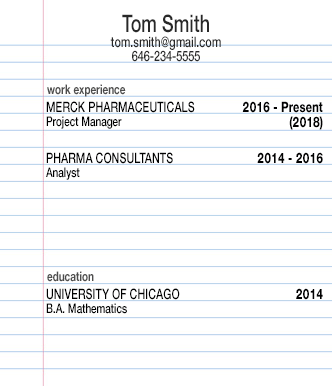 Note: In resume R1 we’re using Tom’s real name and real contact info. If a great opportunity comes up, Tom might want to take it. In resume R2 we’re using a fake name and fake contact info. To ensure additional anonymity, you can modify your current and past employers or schools. If you do that, make sure you look for equivalent firms and schools. For example if you attended a state university…don’t skew your results by replacing it with Yale or Harvard. Whatever changes you make, implement them consistently across all resume variations. Alias: Choose a new name. Create a new gmail account. Get a new phone number. I like SkypeIn numbers. For about $7/month in the U.S. you can buy a new number which you can manage using your Skype account (voicemail and call forwarding). The cool thing is that you can pick whatever area code you want (646 for NYC, 415 for San Francisco etc.). That’s very handy if you’re A/B testing to see how marketable you are in a new location or if you’re contemplating a move back to the U.S. or across country. Ok now let’s run A/B Test #3 – If Tom goes after a promotion to senior project manger at Merck would that give him an edge in applying to tech companies two years from now? Tom decided to get his resume rewritten so resume R1 is a new and improved version of his original resume. Resume Variation R3: Secure a promotion to senior project manager at Merck. Stay in the role for two years. Then apply to tech companies. As you can see, we’ve backdated the resume 2 years. Tip: When you do land a phone interview, you’ll want to know which resume the recruiter has in front of him, so create a log in excel with your three resume variations and the roles you applied to. People often ask, ‘What if I get a phone interview for a fake resume?’. My answer, ‘Take the call’. In fact, I’d suggest moving through as much of the recruiting process as possible. For most people that will mean stopping short of meeting in person. If you’re lucky you’ll be able to take a string of phone interviews from HR, the line manager and possibly team members. Practice makes perfect. An interview now is always good practice for a better interview down the line. Your ego will thank you. Receiving attention from recruiters is uplifting. A lot of the people who reach out to me are unhappy in their current role or company. Being unhappy brings you down and when you’re down your ability to envision the future is hampered. It’s a vicious circle. By interviewing you get to reach out and touch the future and suddenly the future becomes both real and realizable. The interview is your opportunity to mine the recruiter for any information that will give you an advantage down the line when you’re recruiting for a similar role using your real resume and name. In particular, find out about the salary range on offer as well as company culture. If you’re on the fence about getting a MBA, Part-time MBA, EMBA, CFA or PMP ask the recruiter about the company’s stance on these qualifications. Find out if the company frequently promotes high performing employees without such qualifications. If the recruiter says they prefer promoting internally, ask them for the name of one or two employees who’ve been promoted internally in a similar manner. It’s easy for the recruiter to hand you whatever line is convenient for them. If they’re being truthful, they’ll be able to supply you with verifiable evidence. Most people don’t get enough practice interviewing and interviewing is a skill you develop, a muscle you build through repetition. Some people have virtually no interviewing skills at all because they’ve been promoted internally for a number of years. Get help perfecting your interviewing skills. You have options: a friend, a colleague, people from your university’s career office or a professional career coach. Use the interviews as a way to put the feedback you received during mock interviews into practice in the same way that an actor uses rehearsals to perfect his delivery. This is your opportunity to experiment in an environment where a job isn’t really on the line. Be sure to close every interview with ‘I really love this role because ___. Could you share any reservations you have about my fit/about hiring me for this role?‘ That’s pretty ballsy right? Actually that’s something that should already be part of your interviewing repertoire but I’d wager that 99% of you have never tried it. That’s because it’s scary. The interviewer might actually have hard reservations that you can’t overcome (like needing a degree in statistics when you got yours in English literature). But you have nothing to lose. You need to risk hearing those reservations because it’s better to be aware of them than to be ignorant of them. If the interviewer has soft reservations (like having some experience in project management but not as much as the company is looking for) then you need to counter those reservations one by one with pertinent and convincing stories. The recruiter will be impressed. So impressed that they’re going to be really excited about getting you a call with the line-manager. Maybe you’re thinking, ‘I feel bad about wasting HR people’s time in fake interviews’. My answer, ‘Don’t’. So you aren’t going to accept a job offer from any of these companies at the moment. You’re just window shopping. That’s good for you because the pressure is off, but obviously it’s a big waste of time for the recruiter. Luckily the recruiter doesn’t know this. If it helps you feel better – recruiters constantly waste candidate’s time. They regularly bring people in to interview to a) make themselves or their department look busy and b) keep an ongoing ‘pipeline’ of candidates. ‘Pipeline’ job postings are basically roles that don’t have any openings at the moment. Recruiters need candidates at the ready in case someone quits. So they bring people in, interview them, keep them in the ‘pipeline’ for three months and then toss their resumes. 95% of the time a pipeline interview won’t result in an actual job. This step is pretty self-evident. We ran two A/B tests. In Tom’s case he wanted to find out if he should V1) Look for a new job now, V2) Quit working for two years and pursue a full-time MBA or V3) Take the Senior Project Manager role at Merck. All three of Tom’s resumes resulted in phone interviews and he got a good sense of which path could most easily lead him to a role in Tech. A/B Test #1 We tested Tom’s original resume against his rewritten resume. The rewritten resume produced the best results. Several mid-size tech companies reached out to Tom for project manager roles. These roles could serve as a stepping stone on the path to a project manager role at a blue-chip tech company like Amazon. Tom asked the recruiters how their company would envisage his career path with or without an MBA. Some said that they prefer to promote people internally based on performance and didn’t place particular importance on an MBA. Tom realizes that he could forego an MBA by taking one of the project manager roles and advancing organically. 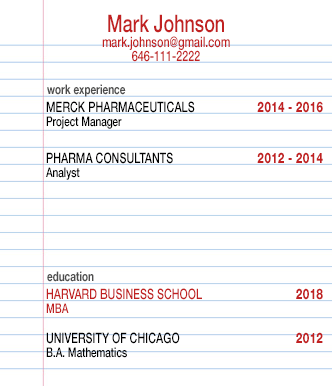 A/B Test #2 We tested Tom’s rewritten resume against his fake ‘take two years off work and get an MBA’ resume. The MBA resume was well received and he was interviewed for a number of post-MBA roles at places like Amazon and Uber. Tom felt that the Harvard MBA certainly ‘opened doors’ for him – getting him in front of a number of recruiters from desirable companies. But he still had to work hard in interview to convince them that he was the right candidate. Tom learned an old lesson: a resume gets you an interview and how you perform in interview determines whether you get the job. Tom was happy with the outcome but the idea of foregoing two years of salary $140k and spending about $150k for the degree added up to $290k – a figured that weighed on his mind. 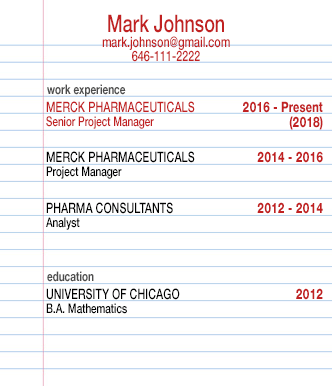 A/B Test #3 We tested Tom’s rewritten resume against his fake ‘stay at Merck and take a Sr. Project Manager role’ resume. Tom found that the advantage of taking a senior PM role was offset by the fact that he was still working in the pharmaceutical industry. Recruiters followed up with Tom for roles in Biotech and Healthcare (which is an industry Tom wants to move out of). He did get some response from some tech startups – but Tom didn’t feel the compensation packages they offered would be worth his while. Tom leveraged his newly edited resume to go ahead and submit some MBA applications while actively looking for a new job. If the right role comes along before he get’s admitted to an MBA program he plans to drop the idea of doing an MBA, invest the $150k in real estate and take the job.